Contemporary Wushu - Chuojiao Fanzi. Halifax Wushu Club. Lu Yan is one of China’s Elite athletes, being a 5 time National Champion in the Chinese sport of Wushu. In a remarkable career Lu Yan took over 10 Gold Medals in Chinese competitions, with an overall medal tally of over 40, whilst also securing the title of Wu Ying, or ‘Wushu Hero’. Lu Yan has travelled the world with the Chinese Wushu Delegation, representing China and performing Wushu in over 20 countries, even performing Wushu in 1974 for President Nixon at the White House. 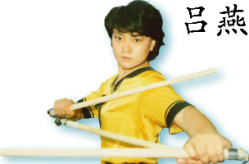 Her Wushu career started at the tender age of only 8, when she was hand picked by the famous Wushu coach Li Junfeng to start training at the then Shichahai Spare Time Sport school. This school was very soon to become far from ‘spare time’ for Lu Yan, when she was invited to join the world’s most renowned Wushu team, the Beijing Wushu team. Over the next 13 years she trained alongside Wushu legends such as Li Lianjie (Jet Li), Wang Jianjun, Hao Zhihua and Li Xia. The exceptional standard of these athletes brought a level of fame to the Beijing Wushu Team that still echoes today.